I find it a little humorous that I was offering up healthy Halloween snack ideas on Monday, just to follow it up with what to do with all that candy! The fact of the matter is you're going to have gobs of candy entering your home or classroom in the next 24 to 48 hours. 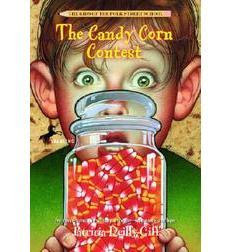 I ran across The Candy Corn Contest recently in my oldie, but goodie stash at school. I loved this book when I was in elementary school, and definitely loved every teacher that had a candy jar! The story is about a class who is trying to guess the number of candy corn in their teacher's jar to win the loot as their prize. The story takes some twists and turns, but is a quick and easy read a loud. It brings some fun discussions up about honesty, fall traditions, and estimation. * Count the pieces of candy by arranging them in groups of two, five, ten, etc. * Order the pieces of candy from biggest to smallest. * Make a bar graph comparing the types and quantity of candy received. If there are two children participating have them make a double bar graph. * Make a pictograph to represent five of your favorite types of candy and how many you received. Remember to create a key for your pictograph that shows symbols and how many each symbol represents. * Make a pie graph to represent the percentages of candy that you received. * Group the packages of candy by color. Leave us a comment and let us know if you have other ways to turn candy overload into learning. We'd love to hear about it!